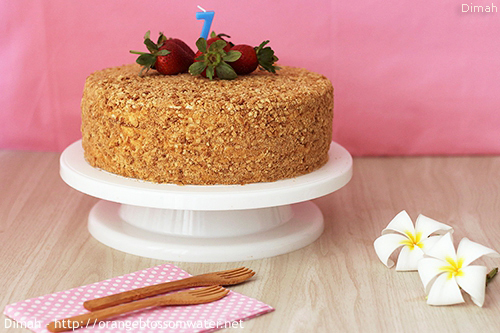 Orange Blossom Water Turns Seven! Today my blog celebrates its seventh birthday. Many thanks to all those of you who regularly visit and read my blog. It’s you dear readers, your comments, emails, and feedback that keep me going and make my journey interesting and fulfilling. Thank you very much for your continued support and love. 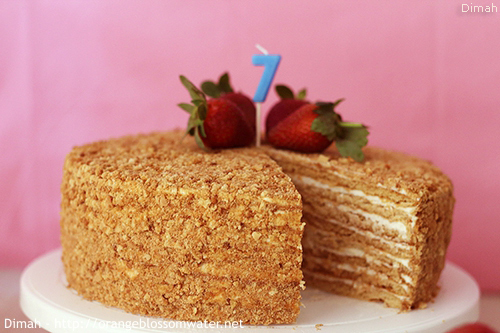 For this special day, I made “Medovik” a classic Russian Honey Cake. Happy Birthday Orange Blossom Water ! This entry was posted on Sunday, February 28th, 2016 at 8:08 PM	and is filed under Celebrations and Occasions. You can follow any responses to this entry through the RSS 2.0 feed. You can skip to the end and leave a response. Pinging is currently not allowed. Congratulations Dimah for your 7th blog birthday…happy many years to come nshalla. Happy 7th and many more in health and peace. Congratulations OBW! I have been reading your blog ever since I made the Aqras Halweh! 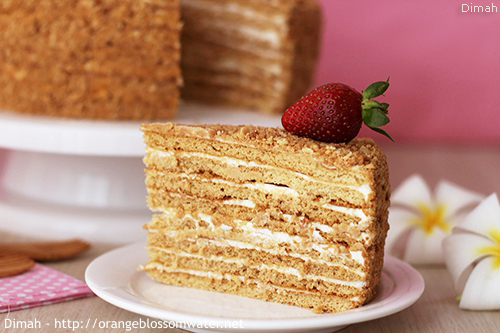 The Russian cake looks so Yum!